The Electronic Textual Cultures Laboratory at the University of Victoria invites you to attend the first meeting of the 2013-14 Brown Bag Speaker Series. This is a series of informal lunchtime seminars for faculty and graduate students in the Faculty of Humanities and across the university to discuss issues in digital literacy, digital humanities, and the changing face of research, scholarship, and teaching in our increasingly digital world. For an hour once per month, we meet to hear from an invited speaker, share ideas, and build knowledge. 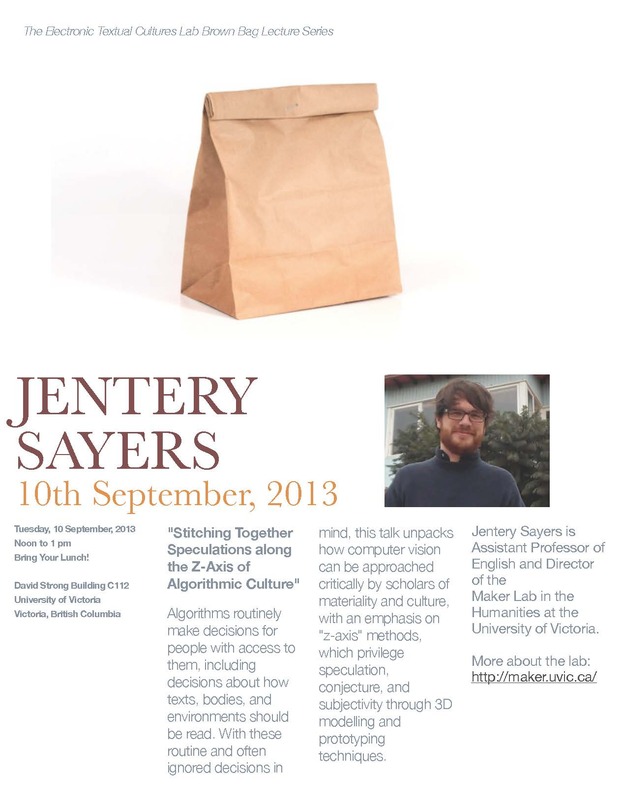 On Tuesday, 10th September, from 12 until 1 p.m. (David Strong Building C112), Jentery Sayers (Assistant Professor of English and Director of the Maker Lab at the University of Victoria) will be presenting a talk entitled, “Stitching Together Speculations along the Z-Axis of Algorithmic Culture.” Details are below. Please share this announcement with anyone who might be interested in attending. “Stitching Together Speculations along the Z-Axis of Algorithmic Culture” | Tuesday, September 10th | 12-1 p.m.
Abstract: Algorithms routinely make decisions for people with access to them, including decisions about how texts, bodies, and environments should be read. With these routine and often ignored decisions in mind, this talk unpacks how computer vision can be approached critically by scholars of materiality and culture, with an emphasis on “z-axis” methods, which privilege speculation, conjecture, and subjectivity through 3D modelling and prototyping techniques. Jentery Sayers is Assistant Professor of English and Director of the Maker Lab in the Humanities at the University of Victoria. Bring your lunch and join us to discuss digital technologies and research in our community! The ETCL’s Brown Bag Speaker Series is organized and facilitated by Aaron Mauro. Post by Laura Dosky, attached to the ZAxis project, with the news tag. Image and poster care of Aaron Mauro.